We have several users that are having the same problem and started a couple weeks go. 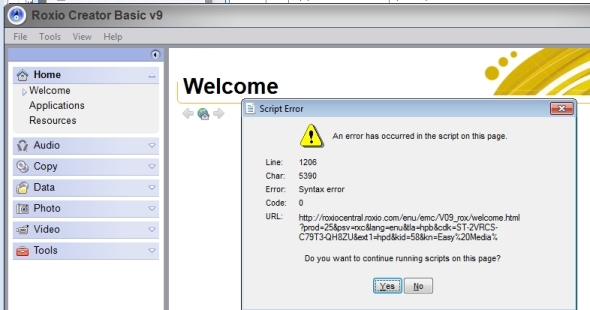 When you launch Roxio Creator Basic v9, you get the script error with a yes/no box. If I click yes or no, the box goes away and I and continue on normaly. 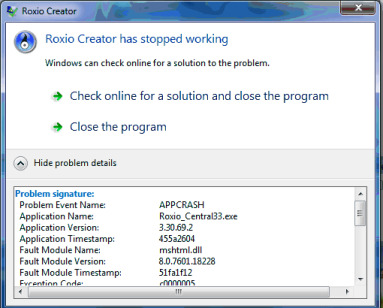 Two others do that and then get a Roxio_central33.exe app crash. It also appears the script is trying to load a advertisement popup which is blocked, or maybe a website that is not there any longer. What OS what IE version? From Tools, Preferences, do you have a screen like this? If so turn everything off that is contacting the web. I don't have a tools->preferences. We have it doing the same thing on Windows 7, and Windows XP. Some get the script error and you can click yes or no and continue to burn media, but on a Windows 7 and Windows XP we get a app crash after that. Windows 7 PC's have IE9, and Windows XP has IE8. 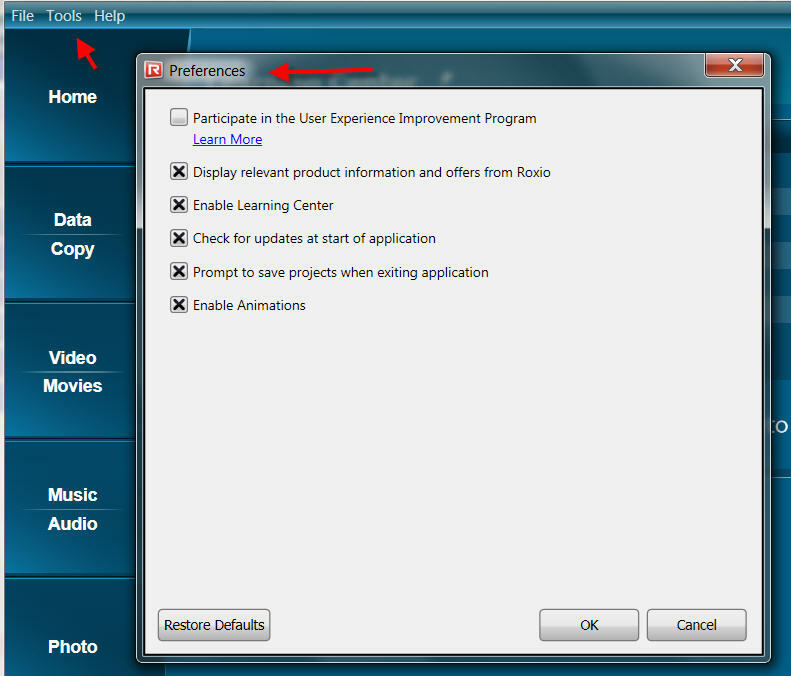 We uninstalled on a Windows 7 and put Roxio creator business hd and it works fine. What is listed under options? 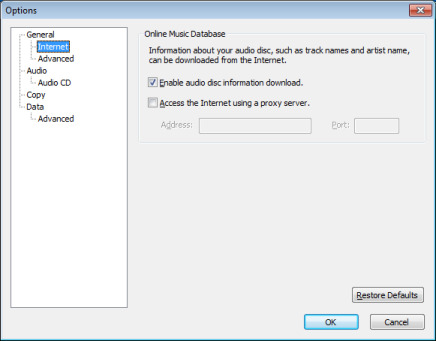 Easy Media Creator 9 is not W-7 compatible. 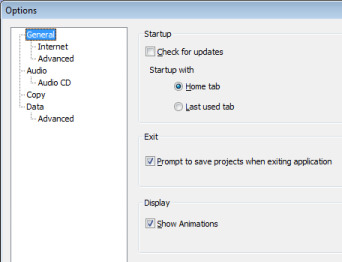 General tab says check for updates, turned it off (no updates available then I checked before), and Internet tab only is for downloading info/artists for music and such. 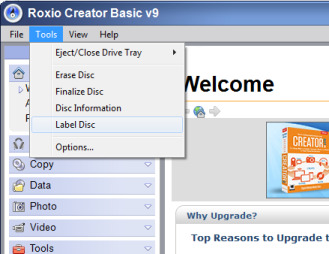 Roxio Creator Basic v9 has worked fine on Windows 7 for couple years. Could be something with our network firewall/content filter. They are checking that but nothing being blocked. I have a newer version I will install on the other system having problems. 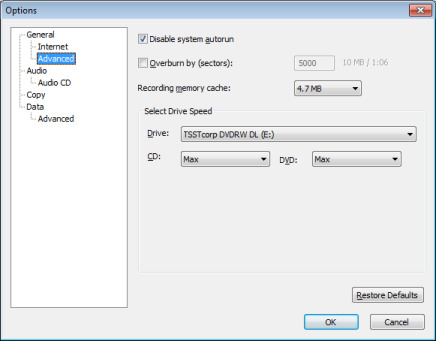 What shows when you click Internet and Advanced? Below are the two screen captures. Thanks been awhile since I've ran V9! Are you good to go then? If you look at that Welcome error box you'll see it's actually reporting a script syntax error. The script sends you to the welcome page at http://roxiocentral.roxio.com/enu/emc/V09_rox/welcome.html, and then feeds the page some parameters identifying your product. I think they've changed the page over the past few weeks cutting out old code, and now it considers the parameter feed for your old product a syntax error. I would ignore it. I can't help with the App Crash, since my EMC 9 Suite is still working fine on Windows 7 once I uninstalled Drag-2-Disc to stop its DLA driver conflict.